While durability is always a consideration when selecting a flooring material, it’s an absolute must for high-traffic applications such as airport terminals, schools, hospitals and restaurants. 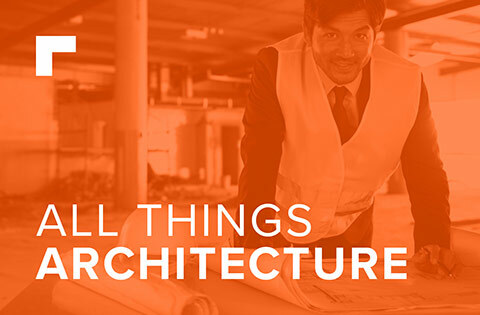 Here, we’ll give you a complete rundown of six of the most durable commercial flooring materials based on cost, application and other major considerations. 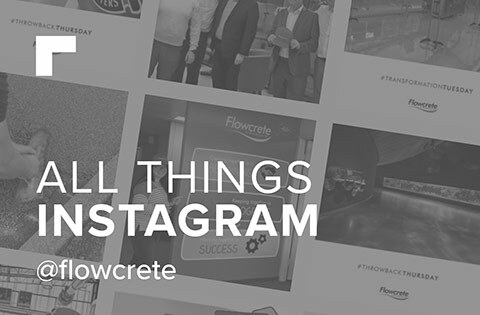 When it comes to durability in flooring, terrazzo is an obvious leader. And because terrazzo is one of the most aesthetically versatile products on the market, it’s perfect for incorporating custom logos and designs into your flooring. Terrazzo is used in situations where you want to impress: opry houses, showrooms, entranceways and high-end office spaces. Although it’s incredibly durable and carries a low lifetime cost, its high upfront material and installation costs are prohibitive in lower budget applications. Generally speaking, terrazzo is not worth the cost in small rooms or sections of a building — the cost-per-square foot increases as the space decreases. Terrazzo is best-suited for large, high-traffic areas such as airports or showrooms where the designer is aiming for a chic look. 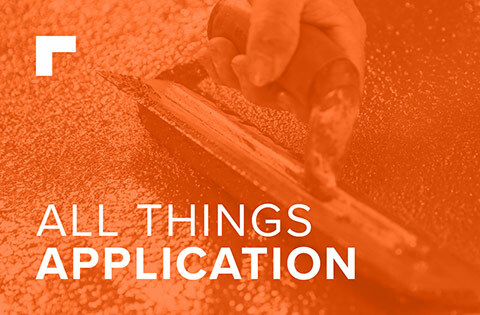 For upscale applications, this LEED-friendly flooring is about as durable as it gets. 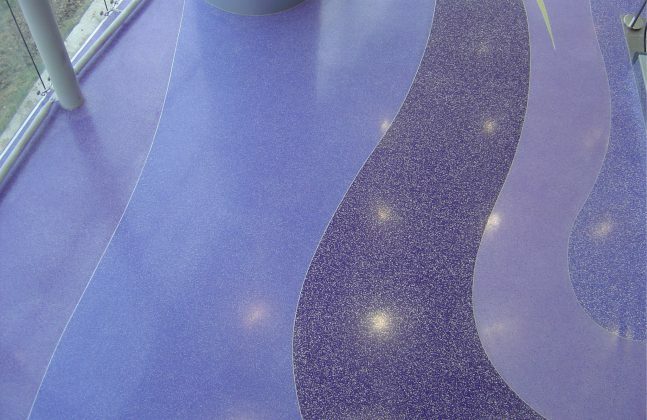 As an epoxy, quartz flooring is typically applied to concrete flooring to enhance resilience and aesthetic appeal. 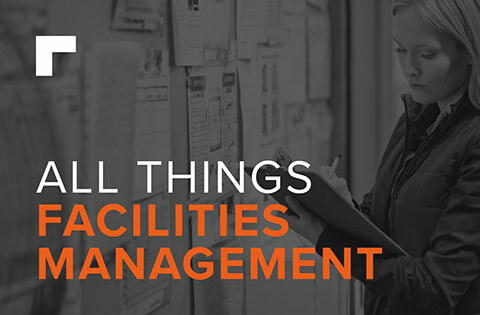 The strong and durable nature of the system makes it a desirable option for many commercial and industrial applications, ranging from manufacturing facilities and hangars to kitchens and restaurants. Once properly installed, epoxy quartz flooring is strong enough to withstand some of the most demanding of conditions while also denying the penetration of dirt, liquid, or any other type of contaminate that could potentially damage or completely ruin the subfloor. In the past decade or so, luxury vinyl tile (LVT) has taken the flooring industry by storm. LVT has proven to be durable enough for high-traffic hospital common areas and attractive enough for upscale restaurants. With a variety of products in every price point and design, LVT is one of the most versatile commercial flooring products on the market today. 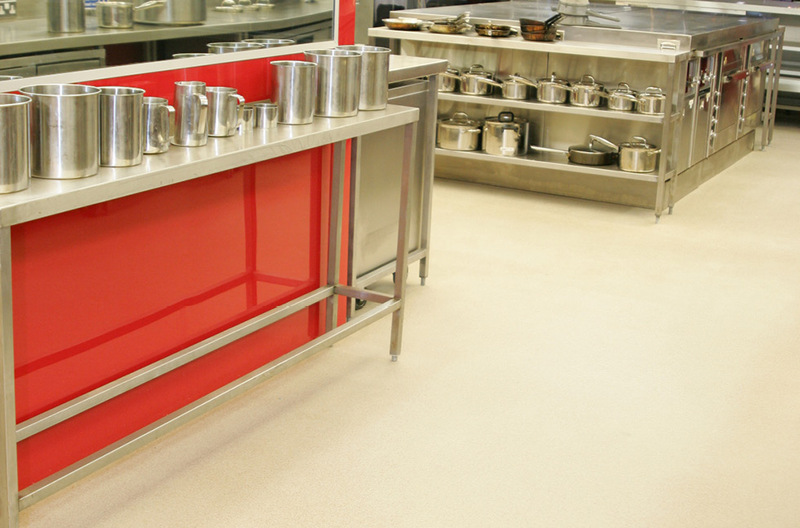 While LVT probably isn’t suited for high-impact industrial or commercial kitchen environment, it’s plenty durable to withstand the foot traffic, abrasions and spills of any office, hospital or school application. Especially in comparison with other resilient flooring products, LVT is more flexible and aesthetically appealing for commercial applications. With LVT, the design possibilities are endless. It’s available in a wide range of sizes, colors and patterns to mimic almost any material from ceramic tiles to hardwood to terrazzo, and everything in between. LVT has proven over time to be able to withstand heavy traffic loads common to commercial applications. In our experience, restaurants, offices and daycares only replace their LVT because they want to change the design — not because it wore out. And because LVT is much quicker to install and cheaper than many of the materials it imitates, it’s a good way to cut flooring costs in a commercial construction project. 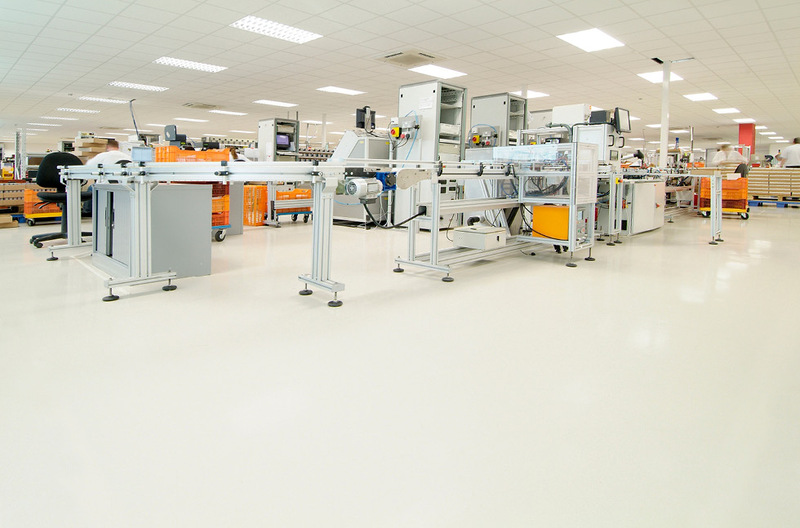 While epoxy flooring is designed for durability, it must be installed correctly to reap those benefits. The concrete needs to be cleaned and cracks patched with urethane prior to application of the epoxy coating. If applied before prepping, the epoxy is likely to peel or chip prematurely. As for maintenance, daily sweeping and infrequent deep cleans should be sufficient to keep your epoxy flooring looking like new. 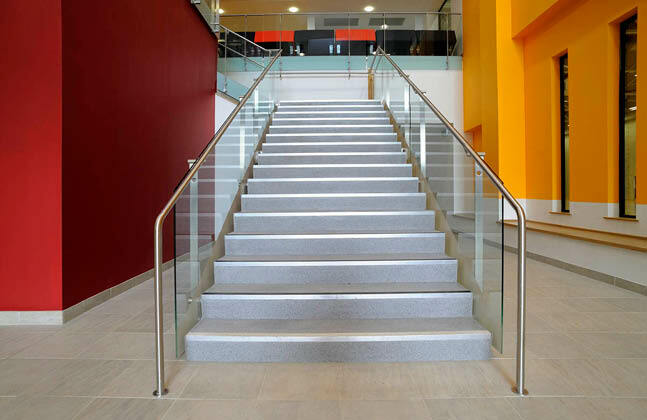 Rubber flooring is durable, slip-resistant and sound absorbent, making it perfect for application in high-traffic applications like hospitals and gyms. 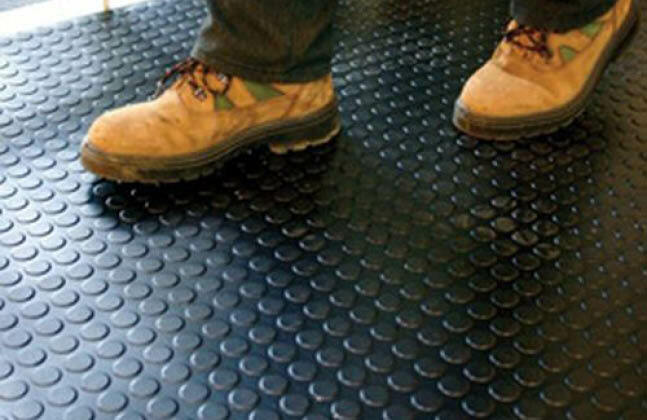 Not only is rubber flooring resistant to wear-and-tear of heavy traffic loads — its cushioned design also prevents fatigue of employees and customers as they walk. It also reduces the volume of noise such as dumbbells dropping or carts rolling, and prevents impact damage to the subfloor below. While it’s easy to install and maintain, its “rubbery” smell will linger long after installation. And its lack of design and finishing options makes this more of a utilitarian product than an aesthetic one. Despite its drawbacks, rubber flooring is a great product for use in gyms, labs and hospitals due to its strength, durability and acoustic qualities. Carpet tiles are taking over the soft-surface flooring market due to their functionality advantages over broadloom carpets. While carpet tiles are more expensive than broadloom, carpet tile systems are easier to replace. For high-traffic areas especially, carpet tiles are your best soft-surface option — it’s much more cost-effective to replace a ruined carpet tile than it is to re-seam, re-stretch and replace an entire roll of broadloom. With the rise of industrial strength carpet tiles waterproof carpet tiles, concerns about spills and moisture have become less of a concern. With consistent vacuuming and cleaning, most carpet tile floors will maintain their appearance pretty well, even under high traffic demands. And as sections wear out, the tiles are easily replaced. Hello, Thank you for this informative article. We are providing long last lasting Rubber Flooring surface with acoustic absorbency and superior comfort.